You wake on a beach, or in the snow, or maybe the desert, depending on which part of the island you clicked on when you started your game, which spawn region sounded like the smartest choice. Before all that, you’d decided what colour hair your character will have, as well as your skin colour, your gender and how tall you are. You even adjusted the size of your muscles (shouldn’t have skipped leg day). You’ve read some guides online, all of them eager to help you out with your first Ark outing, and you’ve learnt that anywhere on the beach (East or South) is the safest bet. Are you ready? Good. You’re a little hazy, and there’s something implanted in your arm. You’ll soon learn it’s a specimen implant, and it’s an important part of the game if you want to get anything done. Once your head clears, you look around and discover you’ve successfully arrived on the beach. It’s lovely. Jungle and trees behind you, a bright blue sky above, and a sparkling ocean spread out before you. You hear an odd sound – a guttural screech somewhere behind you, in amongst the palm fronds. A velociraptor leaps at you from nowhere and rips out your liver. It’s time to respawn in a random location. 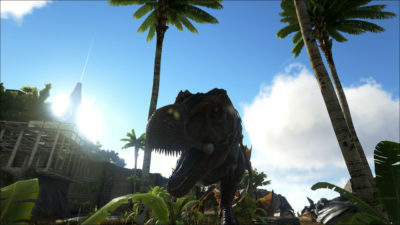 You’ll quickly learn while playing Ark: Survival Evolved that nowhere is really safe in this world, and even on the beaches you’ll find raptors, pesky birds that steal your loot, maybe even a tyrannosaurus rex. As a rule, if it looks too peaceful, treat it with suspicion. A typical early base. A stiff wind could take this down, so start planning for something more solid, little piggy. 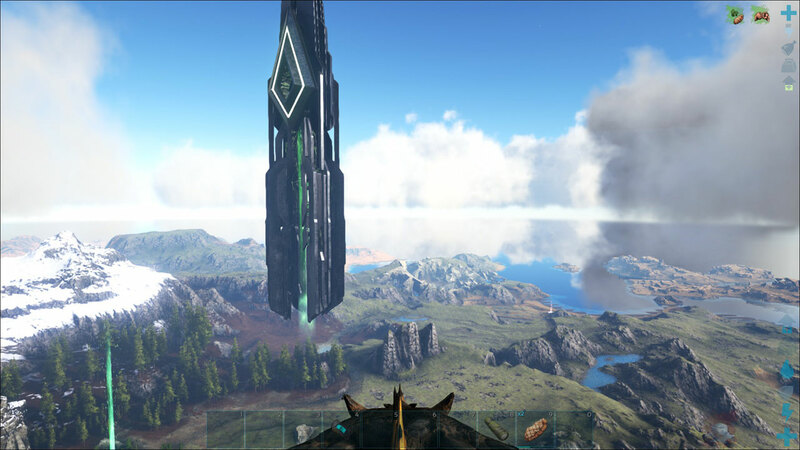 Your first introduction to the world of Ark: Survival Evolved is always rather rude, and the game tends to get a lot more disrespectful as you progress – especially since there’s more at stake later on. It gets bad, it gets dangerous, and there’s so much constant drama that you’ll eventually laugh about that first time a raptor took you out on the starting beach. 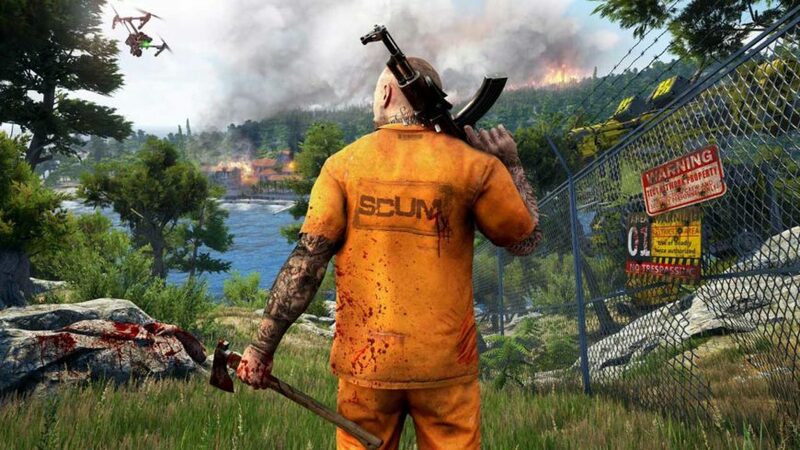 The game’s been available as an Early Access release on Steam for what feels like forever. A little research reveals that it’s been available since the middle of 2015, and it’s become a major hit since then. The appeal is easy to understand. Ark is an open-world survival game that takes place on exotic maps with tameable dinosaurs behind every shady tree. There are well over 100 different creatures in the game, and you’ll be able to tame and interact with all of them. That’s the exciting part. To get there, you’ll have to put in a little hard work. Yes, you’ll have to punch a few trees to get started, but once you’ve got the basics covered like food, water, fire and light, you can start building your base. One of the structures on the map. It’s unknown who or what put them there. These pillars allow you to enter boss fights and move between game maps. You tamed a doedicurus on Saturday night. This means you can harvest rock more efficiently, which in turn means you can finally upgrade that weak wooden structure of yours to be made of something sturdier – like stone. But then you realise that you need materials to craft a saddle for your new rock-harvesting dinosaur. This saddle project requires hide, fibre, stone, and metal ingots. The hide, fibre and stone are easy enough to find on the beach, but the metal means you need a forge and some unrefined metal. So you craft a forge and then go looking for metal. 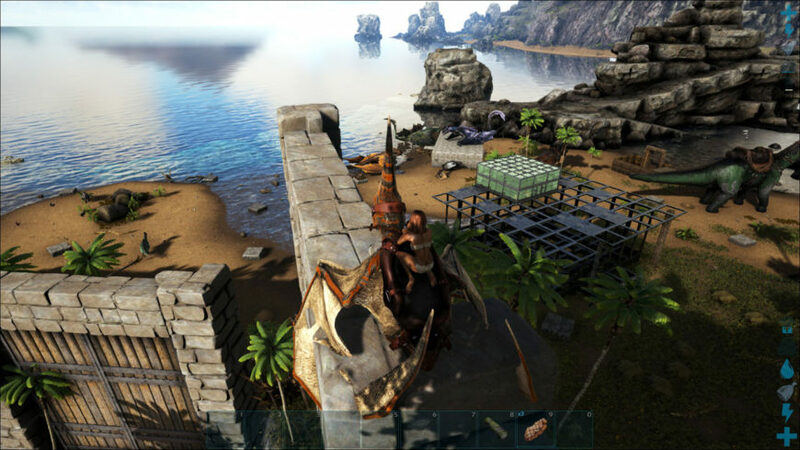 If you’re smart, you’ll have already tamed a pteranodon so you can fly around the island instead of walking or swimming. Adventuring on foot usually means a quick death, so getting yourself a flying critter is rather important. A fairly advanced single-player base under construction. This is Ragnarok, so you can also raise baby wyverns. But before you do that you must steal wyvern eggs. Not easy. The flying part is great for quickly getting around, but these lightweight birds have limited stamina, so you need to land often to rest. Of course, landing means danger, so be careful out there kids. Once you find some metal, getting it back to your base is tricky because it weighs a lot, and that small bird of yours isn’t great at carrying heavy loads. You’ll have to make a few trips to get it all back to your base – at least until you tame a quetzal. Quetzals are massive flying mounts, and can handle a huge amount of weight. I called mine Airbus A380. So now it’s back to base with the metal, and into the forge it goes to smelt it into ingots, the ingots you need to craft the saddle. But hang on – you can only craft the saddle using a smithy. You’ve got everything you need to build a smithy, except unrefined metal, because you refined it all. So it’s back on the bird and back to the metal. It goes on like this for a while, until you finally have everything up and running in your base just the way you like it. Don’t worry, it gets easier – and as you tame new dinosaurs and learn the ropes, materials that seemed exotic when you started suddenly become abundant as you improve your harvesting methods. Soon you’re going to want to expand your base or move altogether, because you’ve always wanted more storage space and this medium-sized stone settlement just isn’t going to cut it. From here, you can move on to a more challenging project, like building an all-metal base. Mammoths provide fur, which is used to create clothing so you can survive the freezing temperatures. 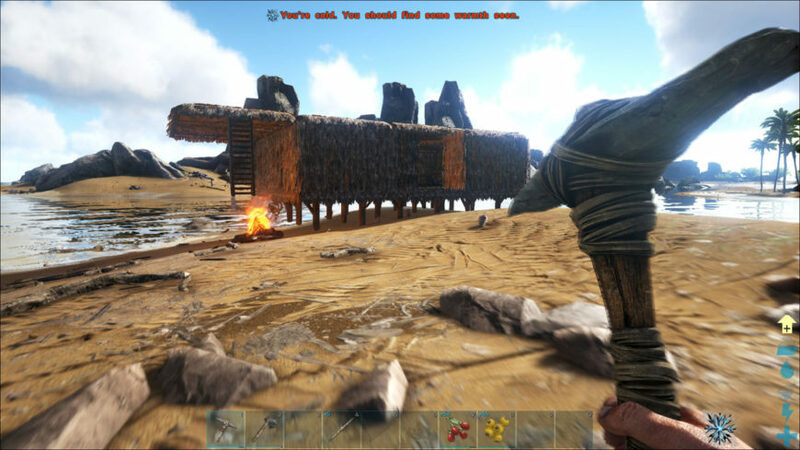 The thing with Ark is that each time you play, you’ll assign yourself a project. You’ll think about what you want, what you need to do to get it, and then get stuck in. 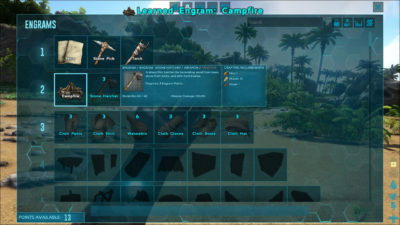 Taming that quetzal while playing solo is tough, so you’ll need an argentavis (another large bird), a grapple, a crossbow, a rifle, some tranquiliser darts, and narcotics to keep the beast sedated while you tame it. Taming is done by knocking out a dinosaur, and then pumping it full of narcotics and food until you can name it and ride it. The more dangerous and/or large the dinosaur, the harder it is. 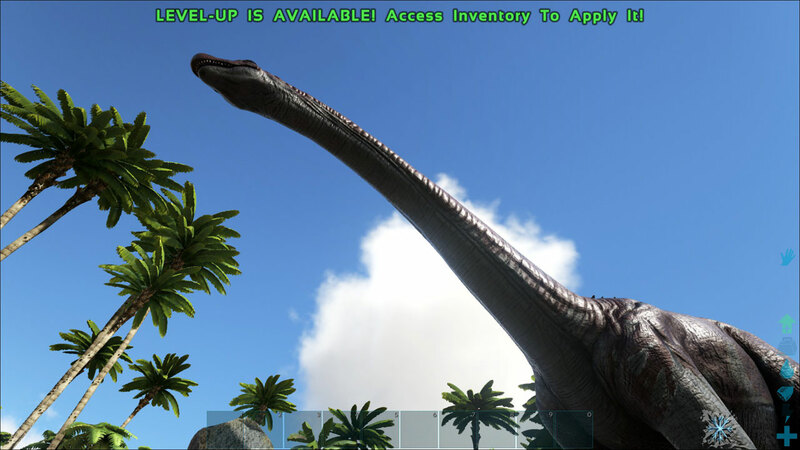 Soon you’ll have an entire prehistoric zoo on your doorstep, from a few small dodos to a towering brontosaur. 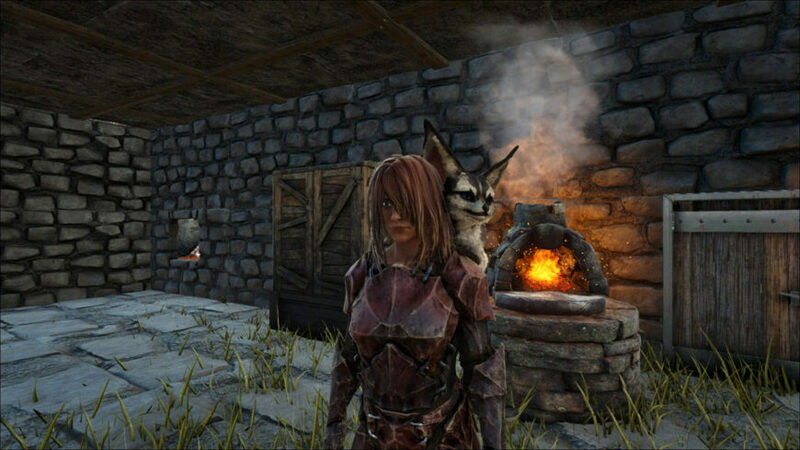 Ark isn’t only populated with dinosaurs though, and if you download the latest free map expansion, Ragnarok, you can tame creatures like wyverns (which are really difficult) and griffons. There’s also a technology layer in the game called Tek, which essentially amounts to high-level content you can learn to craft by defeating bosses. As with everything in the game, simply preparing to enter a boss fight is a whole process by itself. This tier of advanced technology hints at the mysterious nature of the world of Ark. 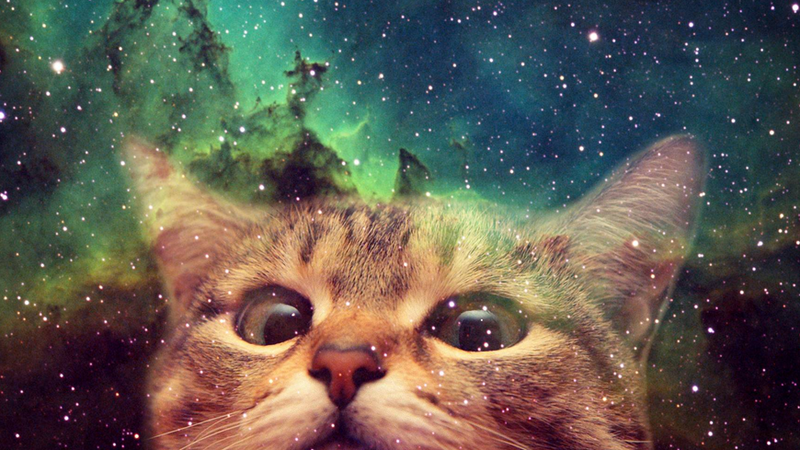 Why are you here, how did you get here, what’s it all about, and what kind of world are you on? The game is really one of those “what you make of it” affairs. If anything I’ve said sounds remotely interesting to you, then this is one of the most fun games you’ll play. You unlock Engram Points as you play. The more you have, the better the bits of equipment you can get your hands on. It’s a delicate balance, and these points are finite. The mighty brontosaurus. If you upset this guy early in the game, he’ll give you a fatal tail whip that’ll fling you halfway across the map. Ark uses Unreal Engine 4 to put on the show, so you know what you’re getting into. I’ve played it on three different PCs with varying specs, and had no performance issues. On the negative side, there’s a very steep learning curve on your path to reaching a point where you’re confident enough to start tackling bigger projects, like taming a T-Rex. Using the Wiki page is essential. It’s pretty difficult in the beginning, so don’t be surprised if you’re killed by bugs, or end up starving to death on your first few attempts. We’ve all been there. Once you get going, the effort you put in will produce amazing results – but the game can get a little tedious when it’s your fifth time starting a new map. That said, punching trees and collecting fibre has an almost therapeutic effect when you just want to clock out of the real world and escape to a dinosaur-filled island. 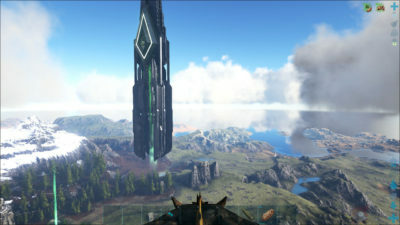 Ark’s developers frequently update the game, adding new dinosaurs and biomes – but while this is generally a good thing, it can also be a bit of a negative. In one patch, for example, they prevented players from increasing the speed statistic on flying mounts, which meant spending more time on the ground. This has since been rebalanced to a more acceptable level, but my point is, be prepared for a bumpy ride. 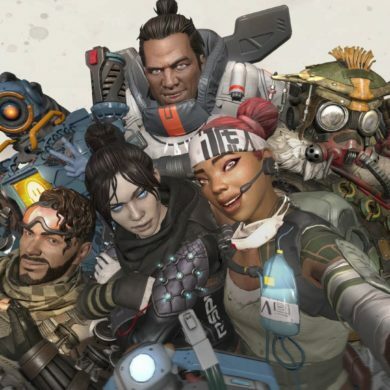 That said, in another patch they introduced an entire new map to play on for free, so the changes and additions they make are often very welcome. The creature on my shoulder is a Jerboa. Keep one of these close and they’ll warn you about impending harsh weather. A nice bonus is that the mod community for Ark is very active. Hyperactive is actually more accurate. From simple tweaks like being able to stack more resources in a single slot, all the way to game-changing additions like adding new creatures and items, such as experience potions and even Poké Balls. 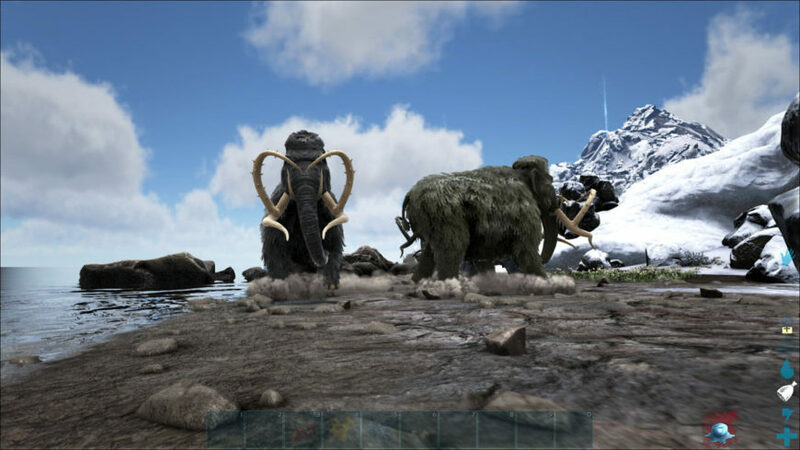 If you prefer, you can always join a PvP server and test your skills against other tribes and players. Just be warned: getting to a point where you can hold your own is going to take a long time. Alternatively, you can just join an existing tribe, and build your skill and reputation that way. Ark: Survival Evolved is a highly recommended experience for basically any kind of open-world survival fan. It’s got everything you need, and a whole lot more you didn’t think you needed. I haven’t even mentioned the underwater caves, giant squids, fishing, dinosaur breeding, and on and on and on. 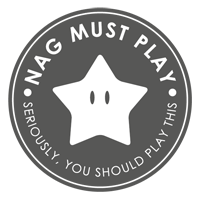 90I’ve got 804 hours of playtime logged. That should tell you all you need to know. 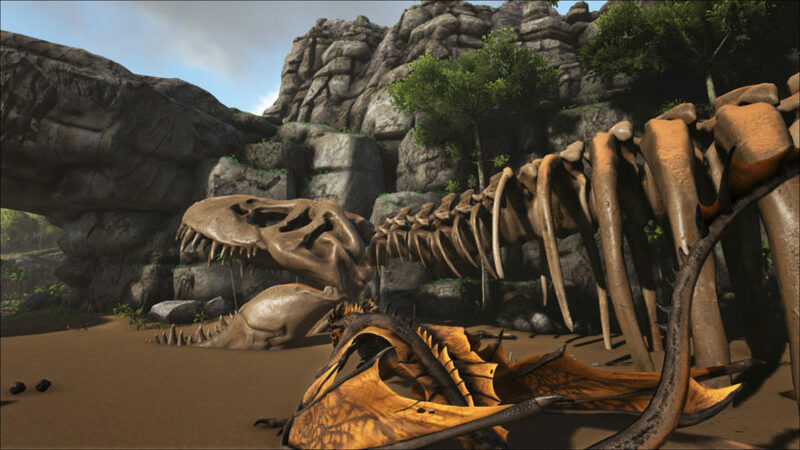 Ark: Survival Evolved is a stunning project, one that makes you wonder why nobody’s done something like it before. Its free-roaming, free-thinking approach means you can make it exactly the game you want it to be. Just be prepared to sink a lot of time into mundane tasks. Or not, it’s up to you.